A fabulous grand villa offering stylish and luxurious living in a scenic hillside position, overlooking Koh Samui's north-east coast. Amenities satellite TV/DVD, stereo, and iPod dock in all bedrooms, fully air-conditioned, gourmet kitchen, BBQ, sauna, spa room, cinema, WiFi internet, car with driver. 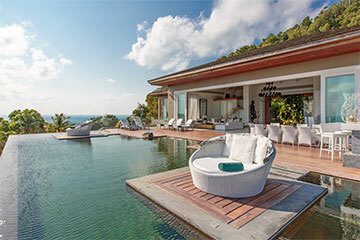 Villa Michaela is a fabulous grand home of immense proportions, with 180 degree panoramic sea views across the entire north-eastern peninsula of Koh Samui. The fully air-conditioned villa features lofty double-vaulted wood-paneled ceilings and slide-away floor-to-ceiling glass walls. Conveniently located between the islands best beaches of Choeng Mon and Chaweng, the gorgeous Villa Michaela offers impressive facilities and sets new standards of luxury. Stairs lead down along the side of the pool to the lower level, which includes a fifth en-suite bedroom, cinema, spa treatment room, and sauna. The lower bedroom suite features a King-size platform bed, built-in wardrobes, satellite LCD TV/DVD, and a free-standing terrazzo bath tub. The ultimate treat for film-buffs, the cinema features tiered rows of super-luxurious leather club chairs, a large projector screen, and state-of-the art sound system connected to a computerized digital library of thousands of movie titles. At the far end of the lower floor is a spa room for massage and beauty treatments, together with a sauna and rain-shower. Complimentary massage is available. Villa Michaela is the ultimate hillside hideaway on the island, and an ideal venue for parties seeking privacy, luxury, and seclusion. The panoramic sea views are particularly dramatic, and the elevated hillside position provides fresh sea breezes for most of the year. An ideal property for friends and family alike, this superb villa is unique in design, concept, scale, and facilities. -A 6th bedroom with twin beds is available on the lower floor, with no bathroom facilities. -Rates are inclusive of airport transfers, continental breakfast and in-villa chef service. -Complimentary massage service for 4 hours per day. -A cash security deposit of $300 USD is required on arrival, to be refunded on departure, less any damages or outstanding bills. -Minimum booking requirement of 3 nights during standard season, 5 nights during CNY, Easter, August and JNY, 7 nights over Xmas or NY, 14 nights over Xmas and NY. 15% discount for stays in June, 10% off stays in July-August, and 20% discount for stays from 22 September-20 December. Cannot be used in conjunction with other promotions. Pay 4 stay 5 in Intermediate season. Pay 3 stay 4 from 1 October-20 December. Applicable to 4 and 5 bedroom occupancy rates only, and cannot be used in conjunction with other promotions. 40% discount for any booking confirmed within 14 days of arrival. Applicable to new bookings, at 4 and 5 bedroom occupancy rates, and cannot be used in conjunction with other promotions. Not applicable for Xmas/NY. 10% discount for booking made 120 days or more in advance. Applicable to 4 and 5 bedroom occupancy rates, and cannot be used in conjunction with other promotions. Not applicable for Xmas/NY. -In-villa spa treatment with extended menu, including complimentary massage for 4 hours per day.